I really like the first one, I think it looks really daring and also well-fitted through the bodice! Sorry the sleeves are so constricting on the second one. I really love both of your takes on these dresses. I think the fabric selection helps hip them up a bit and makes them feel more modern. 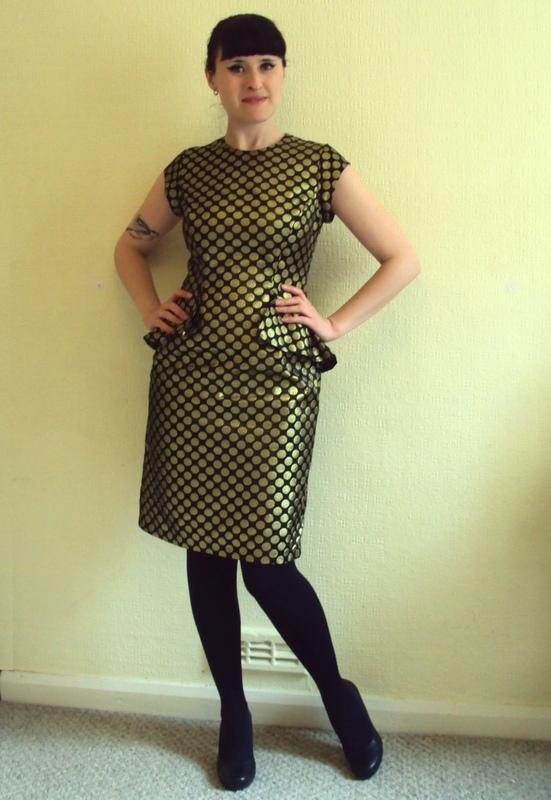 I especially adore that black & gold polka dot. So stinking cute. And it's funny that you reference that dress by Cassie - I just bought some stunning fuschia African prints to funk up a classic 50's silhouette inspired by that same dress! I love, love, love the second dress. I've actually made that pattern myself, and eliminated the center front seam. I also thought the bodice gaped at the back. But I still love that dress. Thee are both WOW's. 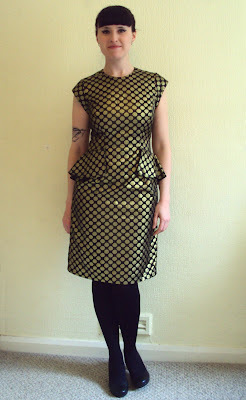 I love the peplum gold number, perfect for a fancy date night. And, birds, OMG. I"m a sucker for anything with animals on it. Too cute! Holy moly lady!! That first one is aMAzing! Defo better with the pencil skirt. Sheesh! Gorgeous! I think both of them look great, I love what you've done with both and they look amazing on you. You rock that peplum dress lovely, and we all know I'm a sucker for 1950's style dresses which, I might add, your fabric choice is genius. I do love how you take something and throw a twist in with your fabrics! 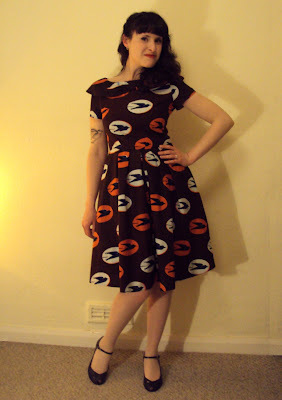 Jeez Zo, I LOVE your versions of these dresses a million times more than the ones 'on the tin'. Fabulous colours, cut and style! They are both unbelievably gorgeous dresses. You are so clever and creative, Zoe. I love your fabric choices. Love them both. The fabric choices are unexpected but work so well. And they both look amazing on you. I particularly like the way you styled the second one with the seamed stockings and shoes. I had the same problem of back gape when I made up the last pattern and I cut the skirt on the fold instead of doing a centre seam as I didn't see the point either. I love your fabric choices and prints and now that I have seen the peplum one made up, I really want it! They both look great, Zoe! I love how mod the first one looks and I'm inspired by your use of waxed cotton in the second one, I have a few metres of gorgeous african cotton that I bought in Paris a few years ago and I have been at a loss for what to do with it. Mine is white so may need to be underlined but now I am determined to do something with it! That first one is amazing! It would be perfect for hitting up vegas or the like! 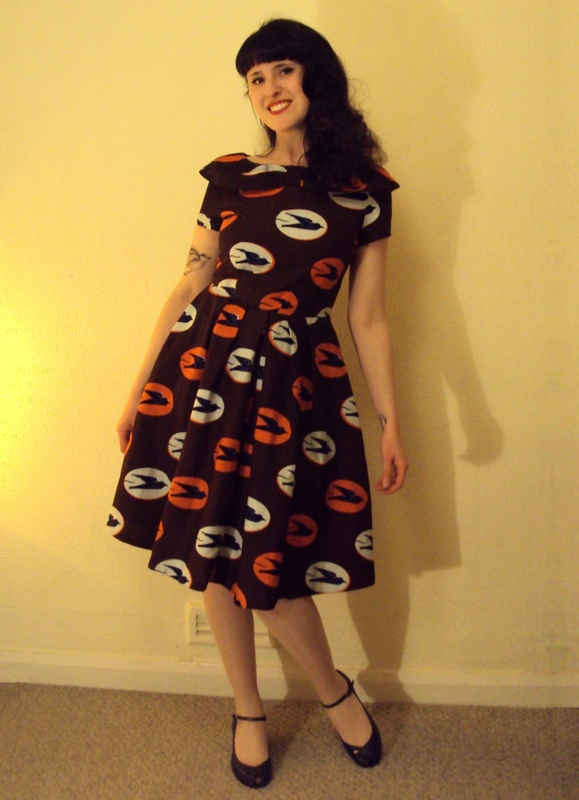 Look at you making more dresses than you had to! Both are just stunning though, despite any issues you may have had/have with them. I was so wrong in my prediction :) The super hero dress is fantastic! You look so futuristic, ready for the alien attack!!! The peplums scared me off a bit, as I didn't want to draw any more attention to my large hips. But you look perfect, and I love how you've pegged the skirt to balance it out. 2444 is great, too! Way to make it not look so fluffy and girly in the African print. I made it as extra credit, and like it a lot, even though I feel kind of weird in full skirts. What's up with the neck gape, huh? Well, I know I've a curvy back, but 1913 & 2444 also fall a bit lower, so I'm wondering if that's part of it? I totally tucked out a 1/2" above the sleeve so I could raise my arms okay. Great work both in fabric choice and your handywork. I adore both dresses! Oh my goodness Zoe, you completely outdid yourself. Both are completely stunning. I adore the peplum-ed dress and the african wax cloth for your second dress is so magnificent. Fabulous work on both! Having seen the first one in the flesh I can for sure it's super. You totally owned it love and that second one is so sweet it's making me teeth hurt. Such a gorgeous use of fabric. You rock! These are both gorgeous! The first one, in particular, is so flattering and sweet on you (well, they both are, but I have already made the second pattern, so it's not new to me)! Great job! This blog social has been so fun-- I've loved seeing what you lovely ladies made! Both of these dresses are so gorgeous!! I love your bold choices of fabric. The large print on the second one makes it really unexpected and cheeky. But my favorite may be the first one - I've just been in love with peplums recently - they do incredible things for one's shate!! 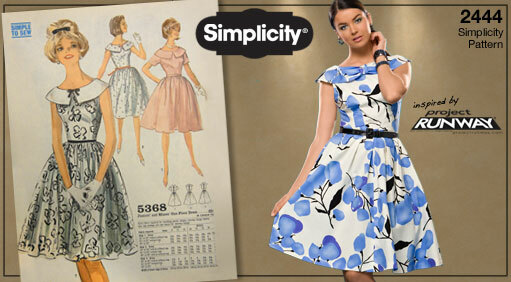 Brilliant versions for both of the patterns! Well Done!!! I love the african batik birds dress, it's stunning and looks great on you. I like it so much I would wear it! 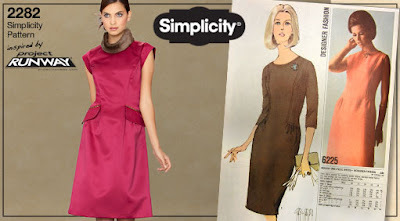 Simplicity 2444 is a favourite of mine. I love your version, I actually made up the same style but without the sleeves about two years ago and really love the fit, although it's possibly a bit short in the waist for me. It's certainly the most vintage inspired of the two I reckon. YEAH... both dresses are awesome. SO glad you have made something with that awesome waxprint. I remember trying to hold it down when I saw it in Makola market in Accra (fabric heaven - a whole hanger of African print) so I wouldn´t get too ripped off in the bartering process! Ok, so I never comment on blogs that I'm reading through google reader, but I really had to stop by and say BRAVO! Both of those dresses are amazing! Great job, great fit! Thanks for sharing! I love both. You look really pretty! !